With Old Glory & The Wild Revival, 22-year-old Jared James Nichols could be a best-kept secret no more. Jared James Nichols might still be a brand-new name to most music fans, but with the release of his first studio effort, a blistering five-song EP called Old Glory & The Wild Revival, the 22-year-old East Troy, Wisconsin native could be on everyone's lips by the end of the year. In 2012, Nichols issued the enthusiastically received Live At The Viper Room EP, and earlier this year he hooked up with noted producer and engineer Warren Huart (Aerosmith, The Fray) to record Old Glory & The Wild Revival at Swing House Studios in Los Angeles. All five tracks - Blackfoot, Let You Go, Can You Feel It?, Sometimes and Take My Hand - display Nichols' extravagant, deliciously unhinged guitar skills, as well as the remarkably intuitive yet free-wheeling support of his rhythm section, Dennis Holm (drums) and Eric Sandlin (bass). Check out the entirety of Old Glory & The Wild Revival above, and have a look at the EPK below to get a better sense of what Nichols is all about. You can purchase Old Glory & The Wild Revival at this iTunes link. 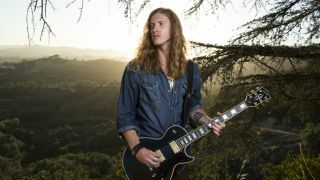 For more on Jared James Nichols, visit his Facebook page.